Next, we see Arthur in a lot of different settings. He’s in a doughnut shop with Zazie Beetz’ character. Then he’s walking to Arkham hospital, and we see him in an ambulance with a person going crazing, talking to Bryan Tyree Henry’s character behind some mesh. He’s in a club laughing at stand-up comedy. Then Arthur’s teasing a young girl wearing a red nose. Arthur says, “I used to think my life is a tragedy, but it’s a comedy.” Meanwhile we see him on stage performing, a crowd of people screaming, all dressed as Jokers — then we see him in the full red suit walking down the street, down some stairs, and that’s it. The trailer really tells us…nothing. It feels like almost a montage of the images we’ve already seen via Instagram, but no reveal of the movie’s story or anything. There’s potential there to be sure, and a mood of real unease—but the trailer isn’t a home run. And as noted, trailer will be online tomorrow so you’ll soon be able to see for yourself. 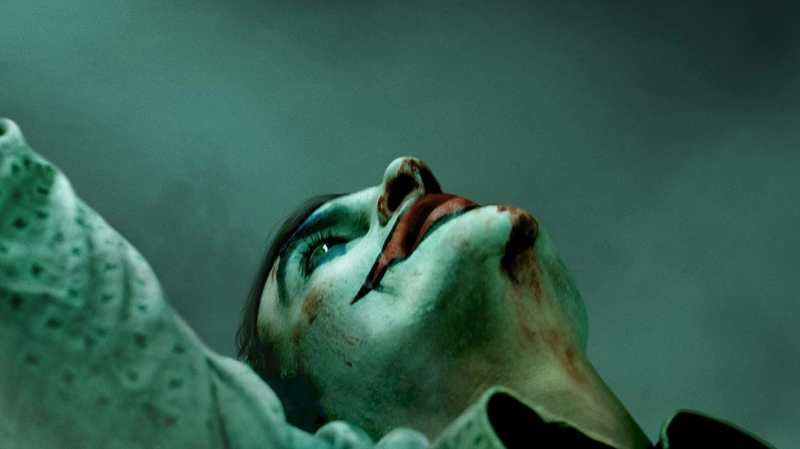 As for all of Joker, it’ll be here before you know it, with a release date of October 2019.